For many who grew up in the 70s, the theme music from Little House on the Prairie, along with the scene of three sweet girls running down a flower-covered hill is reminiscent of a simpler time. Did you want to be like tomboy ‘Halfpint’ or more like bookish Mary? And didn’t you just love to hate mean ‘ol Nellie? In her new autobiography, Melissa Anderson brings the reader back into the world of Little House and what it was like growing up on set as one of the Ingalls girls. 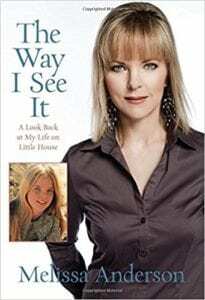 Anderson’s memoir recounts her eight years on the set of Little House, broken down into eight sections, one for each year. Within each section are several chapters recounting the various episodes and personal interactions within that particular season. The author dedicates quite a bit of text to episode plots, indeed several pages per episode. This got a bit tiresome after a while and the book would have been better served by simply covering the behind-the-scenes action. I had also hoped to read more about Anderson’s interactions with Melissa Gilbert (Laura "Halfpint" Ingalls) and Alison Arngrim (Nellie Oleson). These actresses were mentioned briefly here and there, but nothing of any real substance came to light about how the three girls got along on set. Between the episode synopses, Anderson does give the reader some behind-the-scenes information. She tells how Landon could be a wonderful, sweet father-like figure, watching out for his actors while also occasionally displaying a mean streak such as picking on, and laughing at, a crew member with a stuttering problem. She also tells of the tension between Landon and Karen Grassle (Caroline Ingalls), a classically trained actress who got tired of being given small parts and limited dialogue with lines such as, “…more coffee, dear?” To her credit, Anderson doesn’t attack any of her co-stars and does her best to present both sides to each story. While there’s no “dirt” within the pages of The Way I See It, it is a pleasant journey back to the years of Little House. Quill says: Fans of Little House on the Prairie should enjoy this trip down memory lane.